I grew obsessed with this fabric. I didn’t order it in my first 3 months of blogging for Minerva and it haunted me. I’d wake up in the middle of the night and look for it in their store, making sure that it was still there. I’d have dreams where the black squiggles squiggled their way across any blank surface, with rows of humble x-es x-ing their path above. I thought in stripes, I yearned for layers of neutrals. And this obsession confused me and scared me. It wasn’t scary to be obsessed with a piece of fabric. That’s happened plenty of times. What was haunting was that it was such a neutral print. No trace of pink and certainly no fuchsia. No gigantic floral print. What was going on in my head that I could be posses by something so unprepossessing? But I succumbed, and I’m so very happy I did. 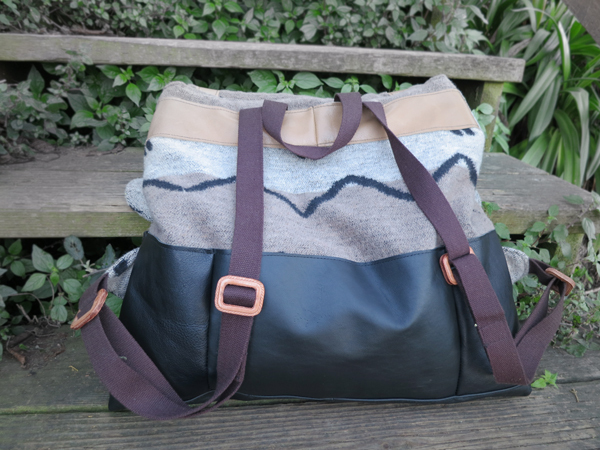 I used this fabric to sew a jacket that I drafted myself and Colette Patterns’ Cooper bag. The fabric is quite heavy (totally unsuited for the dress that I had originally pictured in my head). It is the absolute perfect weight for both an unlined jacket and a bag. While I normally stick to natural fibers, I honestly didn’t realize that this is polyester until checking the product page while writing this blog post. It handles like a cotton fleece and presses like wool (it presses delightfully! like buttah!). Because the fabric is heavy but soft, it makes the perfect choice for an unlined jacket. I’m all sorts of business casual all up in here! (Or at least I’m guessing I am. Having always been in academia, I can’t really claim to know what business casual actually is). I finished the inside seams with double fold bias tape. The fabric is so thick it’s really easy to hand stitch the hem, cuff, and facing to the inside without any stitches showing through. 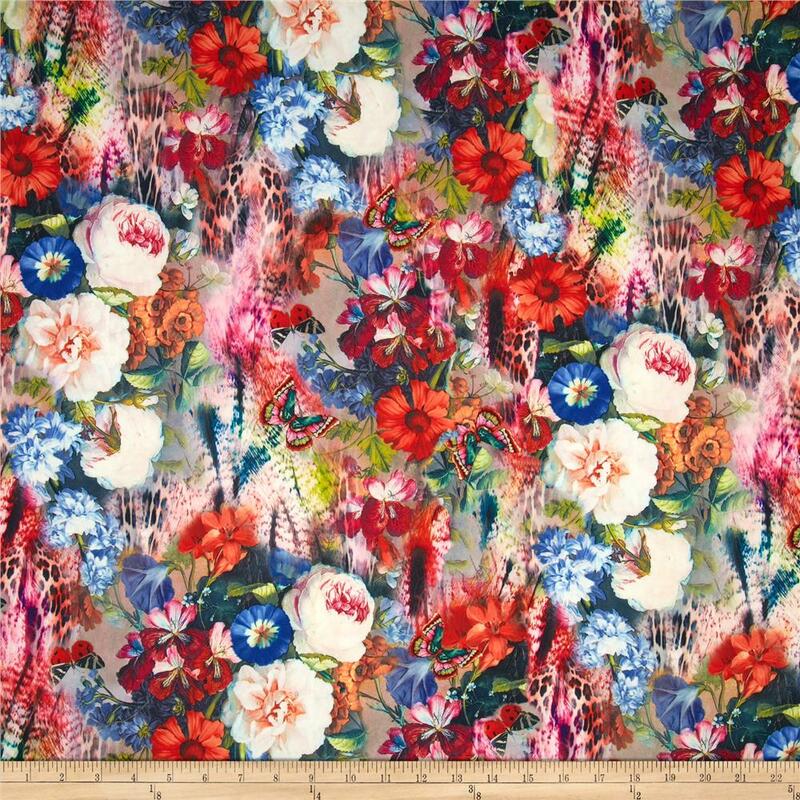 I showed this fabric to a girlfriend and said that I was making a jacket out of it and she said “Oh so you’re gonna rock the 90’s.” Hmmm… not what I was thinking. I don’t think it looks dated (and I don’t really want to hear if you do!). Instead I’m gonna ride on the current trend of tribal print fabrics. And honestly, even if it does look dated, I don’t care! I am so totally in love with this fabric and proud of the jacket and I think I look hot and I’m so totally gonna rock it! I’m pretty proud of the drafting of this jacket. As I said, I drafted it myself. I went through a bunch of muslining to get the shoulders shaped nicely, my perpetual fitting nemesis. I had thought about doing something fancy to the sleeve cuffs and adding welt pockets, but once the jacket came together I thought details would just get lost in this (amazing) bold pattern. There will definitely be a next time to this pattern where I may play around a bit with some of the details. I really wanted to use this single gigantic button that I had in my stash. I tried it out on a test buttonhole and found that in order for the buttonhole to be large enough for it to fit through, the buttonhole was gigantic (ok, not much of a surprise there) and when the button is buttoned, it leaves a whole bunch of the buttonhole showing. I opted to put a snap for the closure and sew the button on top just for looks. Since I had fabric left over, I made a backpack to match. I used several different pieces of leather that I had in my stash for contrast fabrics and opted for both black and tan to play up the palette of neutrals in the fabric. I opted to make the top flap out of the main fabric and not contrast so that I could use the print to full effect. I bought the brown cotton webbing for straps and the gorgeous leather sliders from Britex fabrics since I hand’t planned on sewing this bag when I ordered my supplies from Minerva, but you can easily get all of the supplies you need through Minerva. I threaded the webbing through the slider a little differently than instructed for the bottom sliders since I didn’t want the metal bar to show. This was the first Colette pattern that I’ve sewn, although I have a couple of their dresses in my queue (along with about a hundred other things. But I have fabric picked for them so they probably won’t be tooo far away). I can’t actually speak to how well the instructions were written because I sewed this bag totally out of order to account for the fact that I made up most of it before I bought the snaps and webbing. As I keep saying, I was so obsessed with this fabric that I couldn’t wait a single moment to start working with it! This was the first time that I’ve used magnetic snaps on a bag and I must say that I think they’re swell. So easy to install, so professional looking, and so easy to open and close! Since the leather I had was odds and ends, you can see that I had to piece it together. The join is hidden under the flap. I opted to do all the top-stitching in black regardless of what part I was top-stitching. The only change to construction that I would suggest when working with this fabric is to add a patch of fusible interfacing to the back of the magnetic snap. This fabric isn’t as sturdy as the duck cloth that the pattern calls for so this extra bit of reinforcement will help keep it from wearing. I lined the bag with some Guatemalan fabric that I had in my stash, a gift from a friend. I have used the coordinating pink fabric that was gifted at the same time to make my Guatemalan Cowgirl shirt and to face the pockets on my high waist jeans, so I was really excited to find another project that I adore to use this special bit of awesome fabric. The interior has 4 pockets which is great, although next time I’ll make them zippered since I always prefer internal bag pockets to have zips. I’m impressed that you can actually number your queue! My changes every day, regardless of whether I’ve been sewing or not. I guess I’m too easily distracted! I wasn’t particularly grabbed by the Cooper at first either, but I bought it when buying a couple dress patterns so that my order would be large enough to qualify for free shipping and I’m glad I did because it’s the perfect way to show off this fabric and I’m really enjoying carrying the backpack. What a gorgeous jacket! The fabric is perfection. Very nice! Of course, I love the lining of the bag. Your mention of tribal fabrics reminds me that I have one more batch of fabrics to ship you that includes some real tribal fabrics from West Africa that were brought over by a friend. Are you at the same address? If not, message me your address. I won’t get to sending the package until April or so, but it has been on my mind that you might find some treasures in the remaining stash. This made me laugh so hard! This is what I say to my boyfriend every time he hates something I sew (he hates almost everything I sew). If I love it and think I look hot, that’s all that matters! And I love your jacket! I didn’t think of the ’90s really with the print. It is awesome, I see why you were dreaming about it! Haha. Adam is constantly giving me a hard time about things I sew. Mostly about my repeated sewing of things that I know aren’t a good shape for me or I know are the wrong color. I usually just pass them straight onto my mother, so at least somebody appreciates those projects!! This is great!!! I really like this print too! I’m all about neutrals with a graphic pizzaz :) And that backpack is so cool – I need! “Self-drafted jacket” – said like it aint no thang! That is insane, and it looks amazing! And I think those of us who wear crazy fabrics need boring outerwear, because how else would we wear it?? Aw, thanks! I appreciate the compliments!! Gorgeous jacket! You look pretty amazing in these photos too. Love your hair. thanks! maybe someday :) right now all progress on SeamstressErin Designs is at a halt so I can finish my #*(%&(@)%& graduate degree! 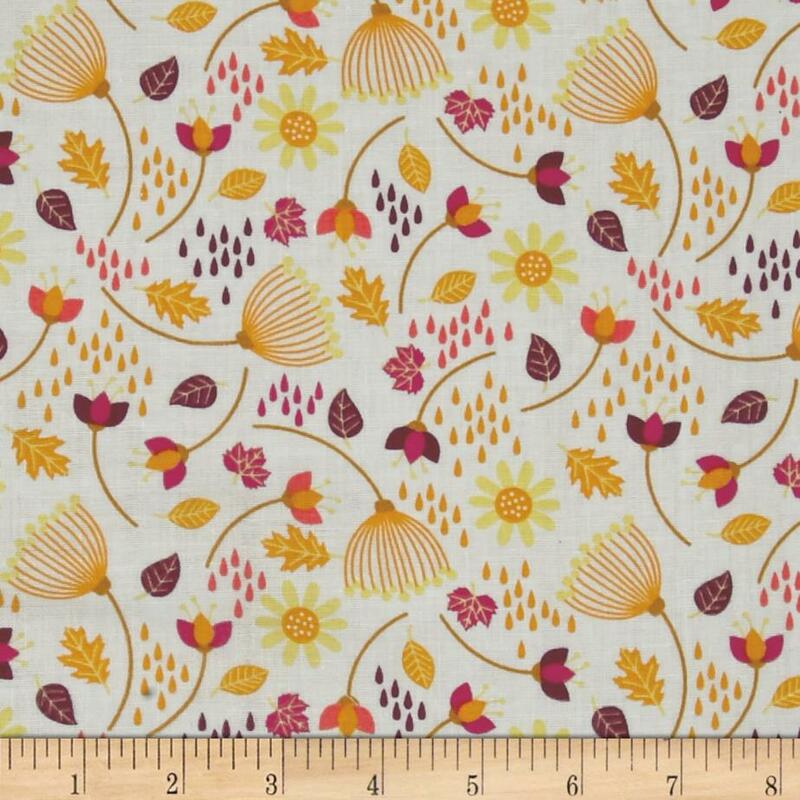 I can see why you’ve been dreaming about this fabric! Love the whole outfit, in fact! A great basic jacket, appropriate for “office casual” or just week-ends in jeans! You’ll be wearing it often, I suspect! I love a gal who knows herself! You are totally hot and rockin’ it, and an amazing designer. Keep it coming, lady! Fabulous! It looks amazing, and I like your little fabric tag. I would love to sew something like that! Love your blog too!